Swing traders love retracements. When a trend retraces, it offers a potential low-risk/high-reward entry into the market. Trader looking for retracement opportunities has one question on their minds. How much does the trend need to retrace? This is a tough question. Shallow retracements often fail, except in the strongest trends. Deep retracements might be a reversal signal in disguise. Both scenarios are tricky. There are various practical methods to deal with this question of retracement. 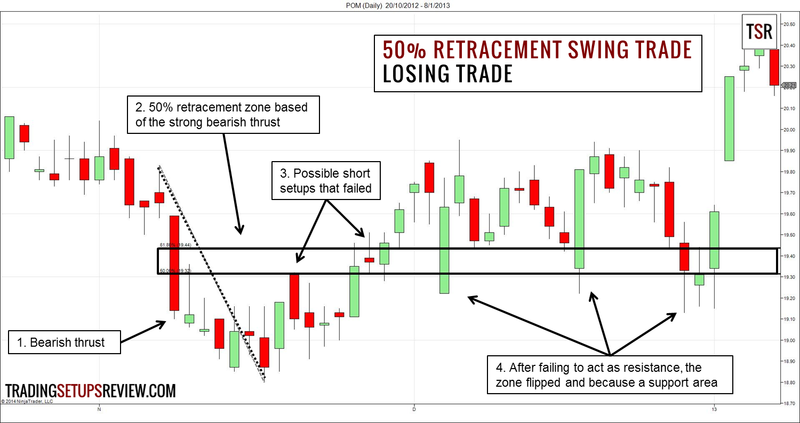 Some traders look for retracements to moving averages like in the 9/30 trading strategy. Others look for Fibonnaci retracements based on a percentage of a prior swing. Among the retracement swing trading strategies, the 50% retracement is a particularly reliable method. 50% is not a Fibonacci ratio per-se, but is effective as a benchmark for a moderate pullback. This is how I look for 50% retracements for swing trading. 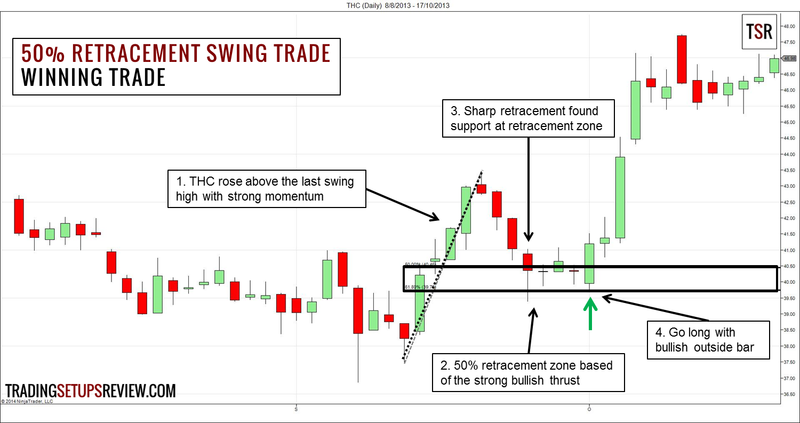 Look for a bullish price thrust that clears above the previous swing high with strong momentum. Mark out a “retracement zone” between 50% and 61.8% of the price thrust. After price falls down to the retracement zone, buy above any bullish bar. Look for a bearish price thrust that clears below the previous swing low with strong momentum. After price rises up to the retracement zone, sell below any bearish bar. If you are not sure how to draw retracement zones, take a look at this Fibonacci guide. The examples below show the 50% – 61.8% retracement zones. The chart above shows the daily price bars of the Tenet Healthcare Corp (THC on NYSE). This is the first strong upswing after a protracted downwards drift. These four consecutive bullish bars rose above the last swing high without resistance. It is a solid candidate as the basis of a 50% retracement swing trade. Hence, we drew the 50% and 61.8% retracement levels of the bullish thrust. The area between them is the retracement zone. This sharp retracement down found support at the retracement zone. The candlesticks that followed had bottom shadows implying bullish pressure. This bullish outside bar confirmed the support from the 50% zone and was a great setup bar. This is the daily chart of Pepco Holding (POM on NYSE). With this bearish thrust, we drew a 50% retracement zone. These two bearish bars were potential setup bars for shorting POM. However, both failed quickly. After the retracement zone failed to resist the market, it flipped and became a powerful support zone. For this strategy to work well, the choice of price thrust is crucial. Weak and short price thrusts will not produce reliable retracement zones. For bullish setups, choose price thrusts with strong bullish bars that clear the last swing high easily. For bearish setups, look for thrusts with strong bearish bars that fall below the last swing low easily. After identifying the price thrust, drawing the retracement zone is straightforward. The next tricky stage is the exact entry timing. In the trading rules above, we used a simplistic entry rule that buys with any bullish bar and sells with any bearish bar. To refine the entry, use candlestick patterns or bar patterns in the retracement zones to prompt your entry. An aggressive entry method is to place your limit order to buy or sell once the market tests the retracement zone. For instance, place a buy limit order just below the 50% retracement level. Using this method with an appropriate volatility stop-loss (like the Chandelier Exit) might offer a better reward-to-risk ratio. This 50% retracement trading strategy is great for patient swing traders. Wait for a powerful price thrust. Then, wait for a nice 50% retracement. If you are afraid of missing the trend and are tempted to enter before price retraces to the 50% level, you cannot execute this strategy. Be patient and reap your rewards. Can’t cope with complex trading strategies? Focus on price action for better and simpler trading.